Fire is more than attractive. Fire’s exceptional beauty gives her influence and power. People who are susceptible to it will do anything for her attention, and for her affection. If she wished, they would abuse their power, crush nations and even destory their own kingdoms to please her. But beauty is only skin deep, and beneath it Fire has a human appreciation of right and wrong. Aware of her ability to influence others, and afraid of it, she lives in a corner of the world away from people – not only to protect them, but also to protect herself from their attention, their distrust and even their hatred. Yet Fire is not the only danger to the Dells. If she wants to protect her home, if she wants a chance to undo the wrongs of her past, she must face her fears, her abilities and a royal court full of powerful people with reason to distrust her. Beauty is a weapon — and Fire is going to use it. I often rely on blog reviews whenever I’m getting a new book from an author that I don’t know. Okay, usually, I rely on covers (shallow, I know), but that only works whenever the book is anything in the realistic genre. 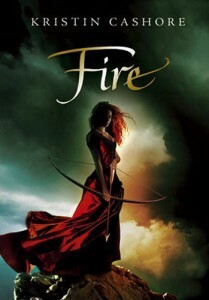 So one day, I was browsing through one of the new favorite YA book blog sites I started reading lately, Persnickety Snark, and saw her review for Fire by Kristin Cashore. Back then, I was looking for fantasy books to read to start my fantasy reading resolution, and I added Fire and Graceling (the companion book) to my mental list. That same afternoon, my friends and I found the latter book, but my friend bought it, so I told myself I’d buy it when 2010 comes in. To put it simply, Fire was one of those books that I’m glad I bought on an impulse. It was one of those books that I couldn’t put down but I don’t want to rush reading simply because I didn’t want to leave the Dells too soon. I started reading this after Christmas and finished up until after New Year, which is already long for a book that I really loved. Characters. I’m a sucker for strong characters. I love it when the characters in a book all leave imprints in me, and that their voice are so distinct that I could tell who was speaking even without the identifiers in the text. Fire, as a protagonist, is a well-developed character, with her physical beauty that could make her own anything she wants and her compassion for the people around her that makes her not like a monster. Even her guard Musa was a real person to me, and she was just a minor character (who probably wears muck boots from time to time). Every character in this book is crafted so carefully and splendidly that I felt that I was inside the story, like I was one of the people who actually got to know Fire as a person and not a monster. Plot. Fire isn’t the type of book that will make you keep on turning the pages. True, the story is captivating, but the story flows steadily, no actual highs or lows or quick action/battle parts that other novels have. It’s not that there’s no climax in this book — not like some other book I know hmph — it had one, but it didn’t consist of pages and pages of descriptions about the climax. The story flowed steadily. Every part of the novel was significant, and after a while, you’ll see the connection with all the little things mentioned in the previous pages. I don’t know about others, but I liked that. Why put a part in the story if it doesn’t have any significance, right? Concept. I mean, human monsters who can make you do anything? Monsters that will eat monsters and if they don’t get that, they can make other creatures with brains go out and convince them to be eaten? How can people come up of these kinds of stories?! So I’m glad I went on an impulse and bought Fire. It’s the companion book for Graceling, which means I kind of know some of the characters in Graceling already because of that, but it’s okay, I think. :D This is definitely one of the best books I’ve read in 2010. Thank you so much for the link. So glad you’ve discovered Kristin Cashore’s work, she is a truly gifted author! Can’t wait to read your thoughts on Graceling. Pingback: One More Page » Blog Archive » Teaser Tuesday: Graceling by Kristin Cashore - Because I can't stop reading them, it's just right to write about them, don't you think? Pingback: One More Page » Blog Archive » Slow Reading - Because I can't stop reading them, it's just right to write about them, don't you think?